Michael Arrington over at TechCrunch thinks Robert Scoble needs a FriendFeed intervention. Michael believes Scoble’s reputation as a "blogger" is suffering because he’s spending too much time on FriendFeed and Twitter and not enough time on his blog. On Twitter Robert has nearly 45,000 followers and has written over 16,000 messages. On Friendfeed Robert has nearly 23,000 subscribers. 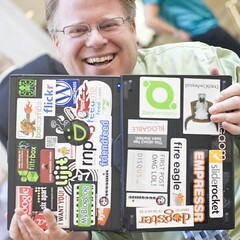 Scoble responds to the attempted intervention on his blog and on FriendFeed. Keep up the good work Robert! I think your investment in FriendFeed and Twitter will pay off. During the lunch break here at the Webvisions event I dove a little deeper into Loren Feldman’s “Puppet Interviews” series and discovered this gem. – The Mike Arrington Show (embeded below). Man, my stomach was in knots by the time I finished watching this. I got a kick out of reading this Valleywag post that pokes fun at Michael Arrington for being down on the valley. Poor guy. Arrington is like Mickey Mouse, in Fantasia: as did the cartoon character in the Disney movie, the Techcrunch founder has cast a spell that’s gone wrong; and it’s too late to put the magic back in the bottle. Dave, a Techcrunch commenter, has it right – the cat fighting between Jason Calacanis and Nick Denton is High School 2.0 and the related Techcrunch post by Michael Arrington reads like an article out of the student-run school paper. On the other hand we’re all reading it so doesn’t that just make us a bunch of High School students? I appreciate Mike’s coverage of the spat and enjoy reading about the more colorful side of the business sometimes. The comments associated with Mike’s post are even more colorful ; ) – locker talk. Messing around with Jason, IMO, isn’t smart. He’s well connected, visible, smart, and rich. Andrew Baron crossed him (listen to this TWit podcast) once and I think that might have marked the beginning of RocketBoom’s trouble. RocketBoom.com Flame-out. Michael Arrington of TechCrunch launched MobileCrunch today – it’s a TechCrunch Network blog. MobileCrunch is the 3rd blog to join the TechCrunch Network (kind or laughing) of blogs – the 2nd was CrunchNotes. Here’s a link to the official announcement. Launch chronology – quarterly goals? Oliver Starr (that’s a resume + some) will be heading up the new blog so Michael can stay focused on TechCrunch. Michael is expanding quickly – maybe too quickly. This might sound crazy to some of you but I’ve started to relate TechCrunch to the old Industry Standard days we all so fondly remember. Is TechCrunch still a blog? IMO – CrunchNotes is a blog, TechCrunch is a business venture. Technically, it fits the definition – but does it fit the "spirit" of what blogs are supposed to be. When does a blog become just another content site? Will TechCrunch be associated with a 2nd bubble much like The Industry Standard is associated with the 1st? Time will tell.